In the former days, it used to be a matter of great concern whenever there were talks of the fuel production like methane because it did add to the problem of the global warming by contributing the greenhouse gases. So researchers had been searching for a simple solution to this gruesome problem for a long period of time and at last they found something incredibly interesting. They are saying that they have successfully invented an artificial leaf that can actually produce the useful fuels like Methane and gasoline from the carbon dioxide from the atmosphere itself. This means that the gases will be produced from the sunlight as well as any carbon dioxide emission that occurs from the cars and that means the reduction in the greenhouse gases. In the past days of research no matter what was done, it was found that there was absolutely no way out in which the greenhouse gas proportion could be reduced. But then, in the final part of the research in artificial Leaf was founds that if the natural process of photosynthesis could be put to use, then these artificial leaves could be created from which many of the important fuels can be produced and that too without posing any more threats to nature. 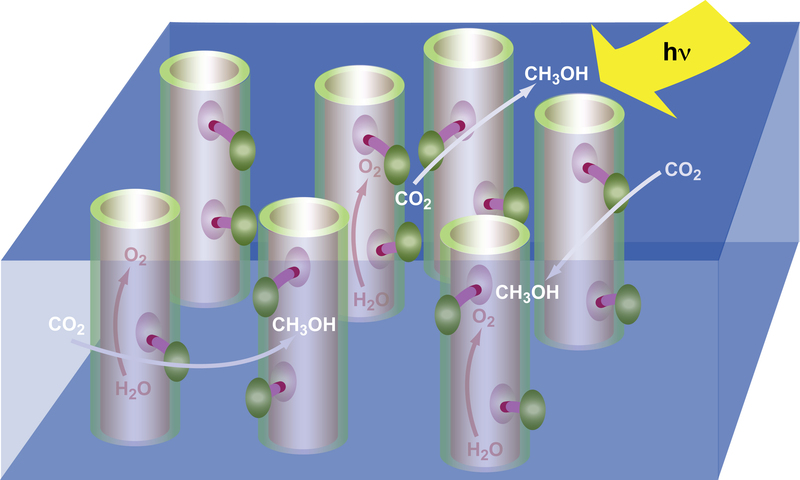 This process is based on the natural process where water and carbon dioxide gets turned in to glucose and then it is processed on to an organic fuel. When the same is done with the help of synthetic photosynthesis, then a lot of other products can be found as well. In order to get it done, the first thing that the scientists tried to do was to derive organic fuel instead of the glucose from carbon dioxide and the process clearly worked out. For this, they had to make up an equipment of the semiconducting nanowires as well as some specific bacteria. Thereafter they made ample use of the inorganic catalysts with the help of which they split the elements of water and then the hydrogen thus found was used to convert carbon dioxide in to Methane. In the former experiments, it was seen that the only hindrance was the incapability of the light electrolysis but that problem has been solved by the use of bacteria and the process has become a lot elucidated. Another similar experiment had also made the scientists come up with the compound of Butanol, also commonly known as Gasoline and other biochemical building blocks. If you think that these liquid fuels are not meant to last long then you are completely wrong as because the recent tests has declared the fact that these compounds lasts for some months and even some years at a go. Scientists say that the main motive behind this artificial Leaf project is not at all to replicate nature in any way but to save it so that the probability of the global warming can be eliminated to some extent. This is definitely something significant in the field of science.